In reality Black Mountain is green. I don’t know what it is that draws me to this particular spot in the desert. It may sound silly, but I feel affection for this place. I leave Bridget and Spike in the PTV (Perfect Tow Vehicle) until I position the BLT (Best Little Trailer) exactly how I want it in front of my bird feeder tree. I look up at Black Mountain and notice that now it’s green all the way to its peak. Scanning the landscape I notice the desert is greener all over. 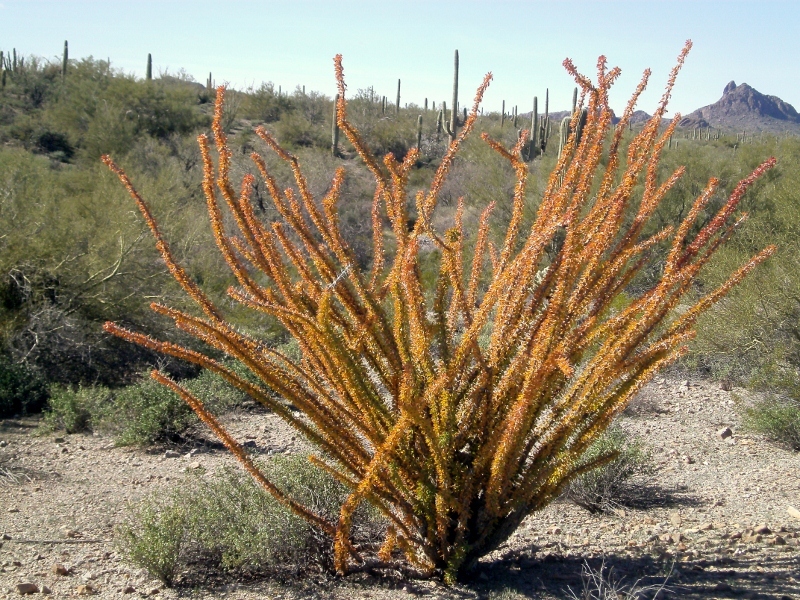 I can see the subtle changes, the slightly fuller palo verde, a few tiny, purple, ground flowers, and the gold ocotillo. The crew is fussing to get out. I place them on the ground where they hesitate for a moment. I can see recognition appearing in their minds. Spike looks up the lane to Rick’s place and takes off. Lady rounds the bend and lopes down to meet him. Spike is shivering with excitement! They run up together to Rick’s place, while Bridget and I follow. Rick comes out of his Scamp with a smile. “Well, hello, Sue.” Rick greets me with his usual understatement. Soon Al of Travels with the Bayfield Bunch comes trudging up the lane, too. Gee, it’s good to be back! If you click on the link, you’ll see Al’s photos of Kelly and me on a couple of his recent pages. You’ll also see a photo of Ann and Bill outside their Casita. Ann and Bill find a pretty camp further up the road. Bill and Ann have a Casita Spirit. 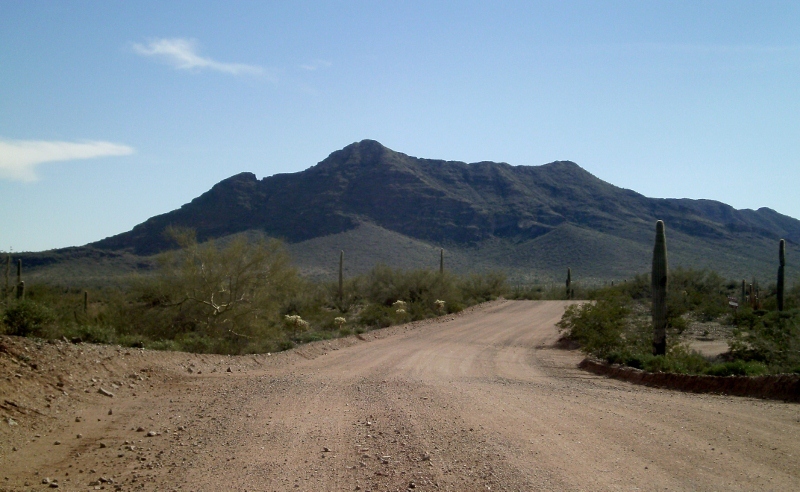 To our surprise, Chuck and Geri arrive shortly thereafter, having driven straight through from Yuma. Unfortunately they only stay two days because they’re having electrical problems. Ann and Bill plan to leave on Sunday. Sunday comes and they decide to leave on Monday. They take long hikes and do a lot of exploring in their Tacoma truck. The crew and I walk up the dirt road to their camp for a late afternoon visit. It’s fun hearing her describe their discoveries. Meanwhile the sunset that evening is mesmerizing. Great swaths of orange sweep across the clouds all the way from Cow Plop Mountain (named for how it looks, not what it’s made of!) to Black Mountain. I know Ann and Bill are seeing the sunset, too, and must be as awestruck as I am. Now for a report of a different nature . . .
Name this plant. This is a quiz. It’s become apparent I need to dump the waste tanks. I suppose I should have done so on the way through Ajo upon arrival. I’m such a miser – after all, it costs TEN WHOLE DOLLARS – I figured I’d wait until the black tank is completely full, probably in four or five days. Unfortunately, I haven’t quite learned to estimate accurately how long I can go between dumps. Staying at campgrounds I would often stop at the restrooms on walks with the crew. And then I have a tendency not to keep track of details such as when I can expect not to be able to use my toilet. I’m guessing about twelve days. Today is day number nine, and the crapper has had just about enough. Anyway . . . The crew and I take the BLT (Best Little Trailer) down to Belly Acres RV Park, dump the tanks, fill up with water, and pay the ten smackers. Supper is a vegetable plate of red potatoes, English peas, whole berry cranberry sauce, and radishes. There’s no explaining that combination so I won’t even try. In the early evening we sit outside to watch another sunset. I throw a blanket down on the mat and wrap Spike up, all except his head. Bridget hops up into my lap and wiggles inside my coat. The three of us watch the late diners pecking at the seed buffet on the ground beyond the mat. The saguaro make stark silhouettes against the light of the setting sun. Bridget’s chubby body is warm against mine. I think about the fullness of our day, the good people in our life, and the peacefulness of this place. How many more sunsets will we see? Bridget wiggles her behind to settle deeper into the seat and the warmth of my coat. My mind wanders back to now as the light fades to darkness. 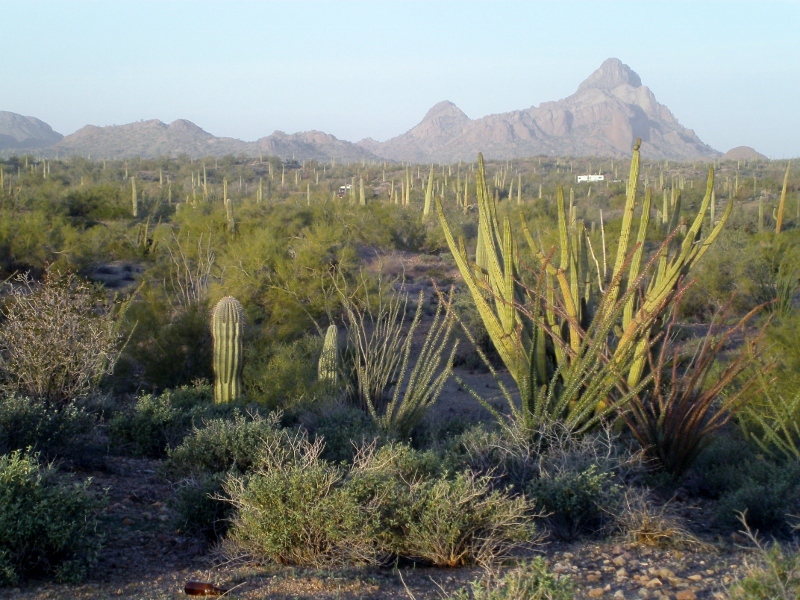 This entry was posted in Simple living and tagged Ajo, Arizona, casita, Darby Wells, desert, ocotillo, palo verde, Sonoran. Bookmark the permalink. No, it is not silly to have affection for a place. I think we all have places that touch our hearts. Your love for Darby Wells is evident in your writing and it is a joy to read. Love the photos of the greening desert – what a wondrous place. The fullness of our day, i like that!! Hi, Dolores! I hope you had a day full of good things! No campfire . . . gotta come inside and fight with my stubborn computer. Hugs back to you and the whole family. . . Nice to get an email from you today. That photo is priceless! Love you, too. I hate being caught off guard to discover full tanks. Takes some getting used to. I’ve found a few places in the desert and mountains that I always return to. There’s no doubt I’ll come back here next winter, God willing. 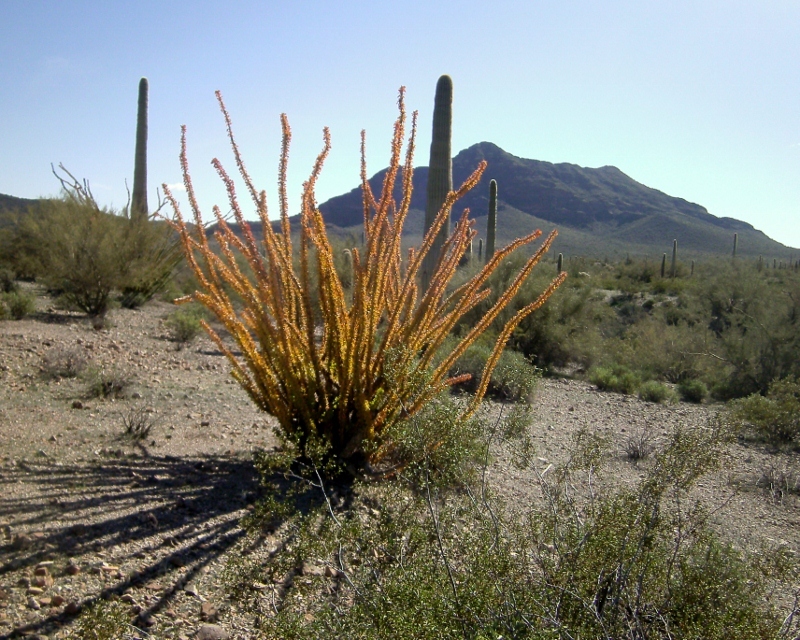 I hope you stay there long enough to see the ocotillo and saguaros bloom! That will be beautiful. Also the desert shoud be full of wildflowers soon. I do want to see the flowers and blooms. I once asked, “Is there a window in time when the desert blooms before the snakes come out?” and all I got for an answer was a laugh. Outstanding blog, Sue, and very well written. I am really enjoying reading it. 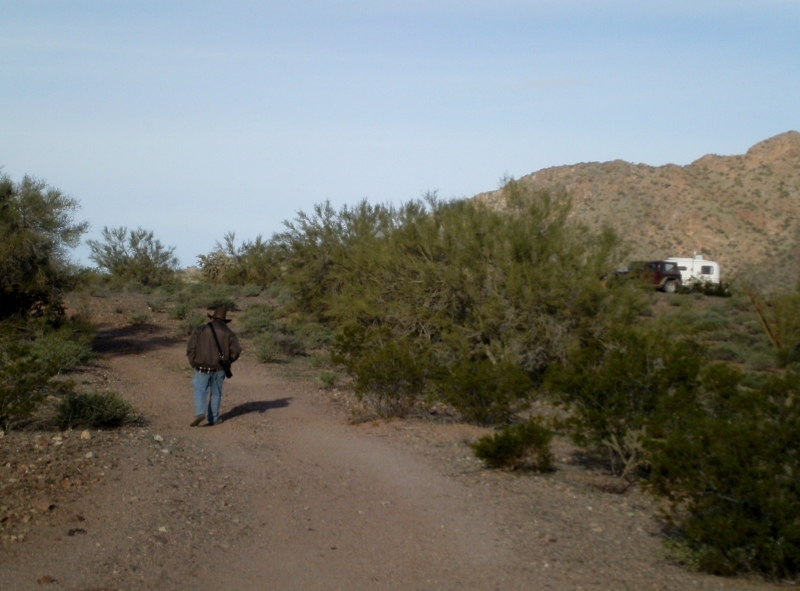 But, it is giving me a yearning to return again to Quartzite next year and wander around the west with my smaller Casita and Jeep. It is just so far from Florida. What system do you use for uploading daily to your blog? Welcome to my blog (if I haven’t already done so) . . . and thank you for the compliment. I know what you mean about Florida being so far. I’d love to plan a trip to visit my sister in southern Florida, but, whew, that’s a lot of miles and a lot of gas. I’m not sure I know what you mean by my system . . . Sometimes I write things “in my head” while I’m out walking the crew or watching the birds or doing some chore. I type on Word. My photos are imported from my memory card onto LivePhoto where I crop them, correct the usually crooked horizon(! ), and resize them. I select and paste what I’ve written into wordpress. Then I move the photos from LivePhoto. . . if I’m lucky and don’t lose signal in the process . . .again and again !!! Thank you for sharing. Your writing really mesmerizes me. I want to be there, now, even though I can’t. Oh well. I’m sorry you can’t be where you want to be, Page. I’m happy I can bring some of the desert to you. Thanks for the compliment. I continue to enjoy your blog – so glad you returned to Darby Wells. That location looks absolutely perfect! 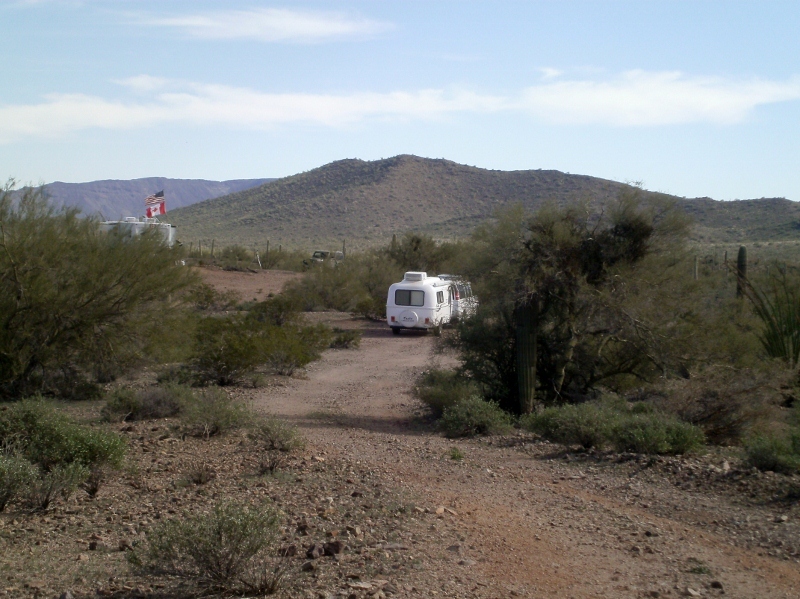 It is a TLC – terrific little campsite..
It’s a TLC for the PTV and the BLT . . . I envy the freedom you and the crew have and the friendships you have developed on Darby Wells, and am happy that you have found your perfect spot. Though I don’t leave comments regularly, I do follow your blog and Al’s blog daily. You both have a wonderful gift to your writings that whisper “Welcome” Thank your for the morning coffee break visits. What a nice comment. Thank you. Your first sentence sums up why I’m loving this life! I’m proud you find my blog worthy of your time each day. Welcome, Sandi! Have a safe trip. Doesn’t matter how stressful my morning can be, once I get to read your blog I forget about all of it and get wrapped in the beauty of whatever you share with us. The photos are wonderful. Thanks, Teri, for that uplifting comment! You may not like this suggestion, but if you turn off your water pump you can press down on the toilets flush pedal and look in the tank with a flashlight to see how full it is. You may not like THIS suggestion, but I can HEAR when it’s time to dump. How gross is THAT? Sue, that’s the “method” I learned too – listen. Had a good chuckle. Hi! Glad you are having a mild winter. Thanks for your positive comment. I love compliments! The feeling in this post is just what my very best days and places of RVing convey. It’s almost spiritual and wish I could sprout wings and be right there with you. I’m definitely going to seek out this place. Love reading your blog. Interesting comment. It occurs to me that maybe “your place” is different than “my place.” Wherever your wings take you, I hope you find your special ground. This is your best daily blog ever. I was sitting right beside you, being happy with my life, enjoying the sunset, the dogs, and could even hear the sounds. Don’t stop writing – since I get to live vicariously through you when you write blogs such as this one. Thank you,Pam. I’m pleased to hear my blog has that effect! Thanks for addressing the delicate question I had in my mind about your grey and black water tanks when boondocking. What do you do about getting rid of your daily trash, i.e. soup cans, coffee grounds, etc.? Just got back from a trip to FL in our 17′ SD. Wanted so much to join you in Quartzsite, but the weather across the south on I-10 was awful, so made plans to go to the desert in May, which is probably too late to see the windflowers bloom :(. We were once stopped by a state trooper in Utah, while parked by the side of the highway, just admiring the blooming cacti. He couldn’t believe that we were so in awe of the blooms. Hope you get a chance to see the beauty of Utah when it warms up a bit. It’s unlike any other state. Where do you plan to summer? Keep writing. Your pictures are beautiful! I hope you enjoyed your Florida trip in your Casita. Interesting anecdote about the state trooper. Beauty is where you find it and some people have a hard time seeing it. I do plan to visit Utah this summer. You aren’t the first to say it’s unlike any other state and that it’s beautiful. Thanks for reading my blog and encouraging me to keep writing. Oh, I almost forgot to answer your question. I put grease and garbage in a coffee can or other closed container and take it to the dumpster in town. I make an effort to recycle paper and plastic, rarely burn because I don’t make a lot of campfires. If it’s something like an orange peel, I put it in a tree for the hummingbirds, but I’m mindful of attracting rodents. The PTV is my great big garbage can until I make a trip into town!